Oil giant BP has acknowledged it is "absolutely responsible" for cleaning up a huge oil spill after an explosion at one of its wells off the US coast. But BP boss Tony Hayward said the firm was not to blame for the accident which sank the Deepwater Horizon rig on 22 April, causing the slick. He said the equipment that failed belonged to drilling firm Transocean. Both companies are expecting lawsuits over the slick, which threatens to cause major ecological damage. US President Barack Obama has described the oil leak as a "potentially unprecedented" environmental disaster. "BP is responsible for this leak. BP will be paying the bill," he said. The US government has been putting pressure on BP to act quickly. In a BBC interview, Mr Hayward dismissed talk of a rift between BP and US officials. "Despite some of the rhetoric we have established an incredible co-operative relationship with the federal authorities," he said. "It's clear that we're working very well together. In terms of the responsibility, I want to be clear, this was not our accident but it is our responsibility to deal with the leak and clean up the oil." 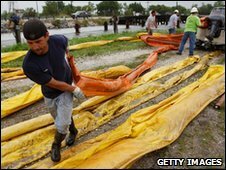 Thousands of barrels of oil have been leaking into the Gulf of Mexico every day since the rig sank. Some oil has washed ashore, but officials say the bulk of the slick remains a few miles from the Louisiana coastline. The oil is already having a devastating effect on the area's fishing industry, and officials fear much wider environmental damage if the full slick hits land. Forecasters said south-westerly winds on Monday were pushing the slick towards Florida. 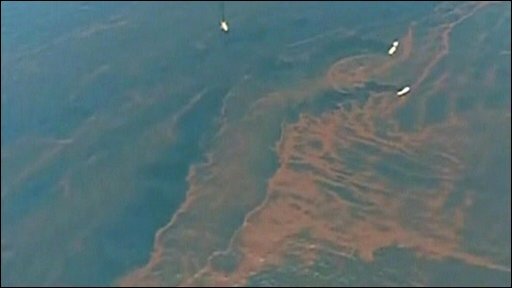 Experts warn that the cost of clearing up the spill could run into billions of dollars. BP has said it will honour legitimate claims for compensation from people affected. The firm's shares continued to fall on Monday, after previous trading had seen about $20bn wiped from its market value since the accident. UK markets were closed on Monday, but BP's Frankfurt-listed shares opened 8% lower before clawing back some of the losses. Analysts say the costs associated with the slick are uncertain, meaning that the share price was likely to remain volatile while the leak continues. In California, Governor Arnold Schwarzenegger withdrew his support for a plan to expand oil exploration off the state's coast. He said seeing TV images of the spill in the Gulf had changed his mind about the safety of offshore oil platforms in the Pacific Ocean. He had supported more drilling as a way to ease the state's budget deficit.